Hey guys, Want your drinks to have a Superman Man of Steel Symbol in them? 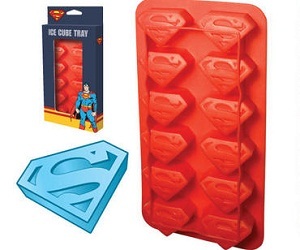 Then take a look at this Superman Ice Cube maker, you can find it on Awesomeinventions.com and we have got to say that these are a great idea, Just as good as Batman Ice Cube Maker! Now My Drink can Look Super Cool With this Man of Steel Ice Cube Maker! Superman Ice Cubes - Awesome Inventions say "Why use ordinary ice cubes when you can use the power of the man of steel to create epic superman ice cubes! This officially licensed ice cube tray will make 12 cubes at a time. Great for chocolate too! YUM"